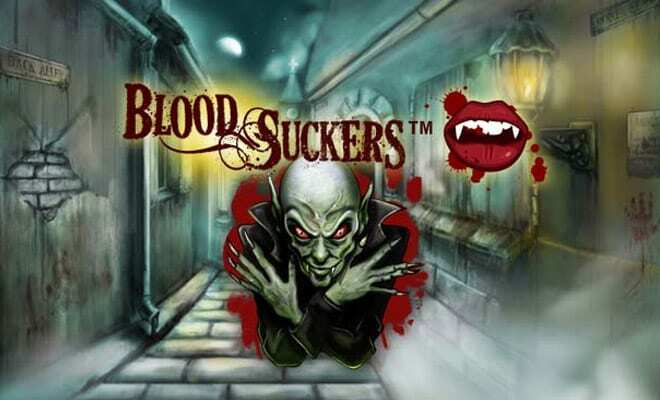 Bloodsuckers is the amazing new play video slots with a Devilishly wicked vampire theme and horror fantasy backdrop. You guessed it, Bloodsuckers is a game centring around the blood-sucking capabilities of some debonair Victorian vampires. 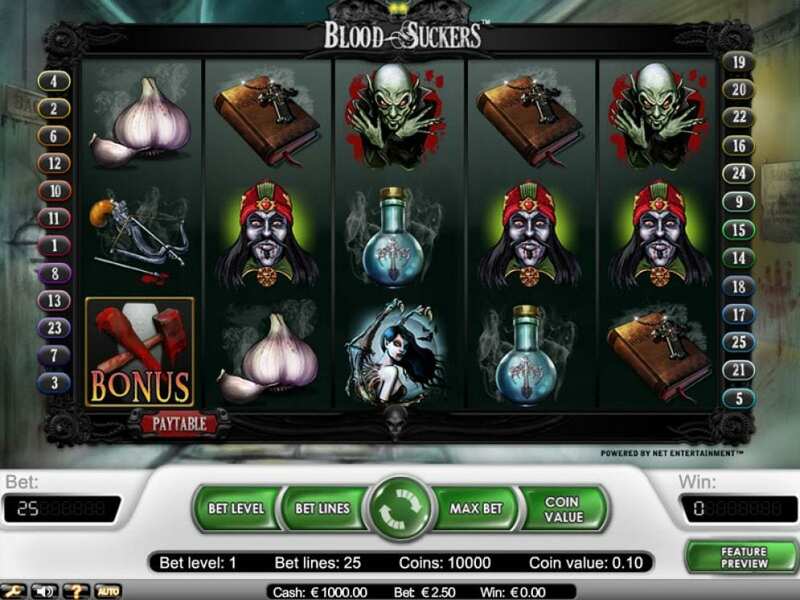 This 5 reel video slot has 25 pay lines and features a range of symbols that include spellbooks, cloves of garlic, and various mystical goblins, strange vampires, and voodoo people. If you’re looking for a harrowing Halloween affair then Bloodsuckers is the game for you. Deposit and spin today to win an exclusive range of free spins and cash rewards. NetEnt gaming is perhaps the most renowned developer in the online slot world bringing a range of exclusive video slots to the market that includes titles such as Gonzo’s Quest and also the famous Guns n Roses video slot. It’s hard to look past their games in terms of the video immersion that they bring but they always bring us games that have a high level of quality, and with great themes. There are lots of slot games to try today on Wizard Slots today. 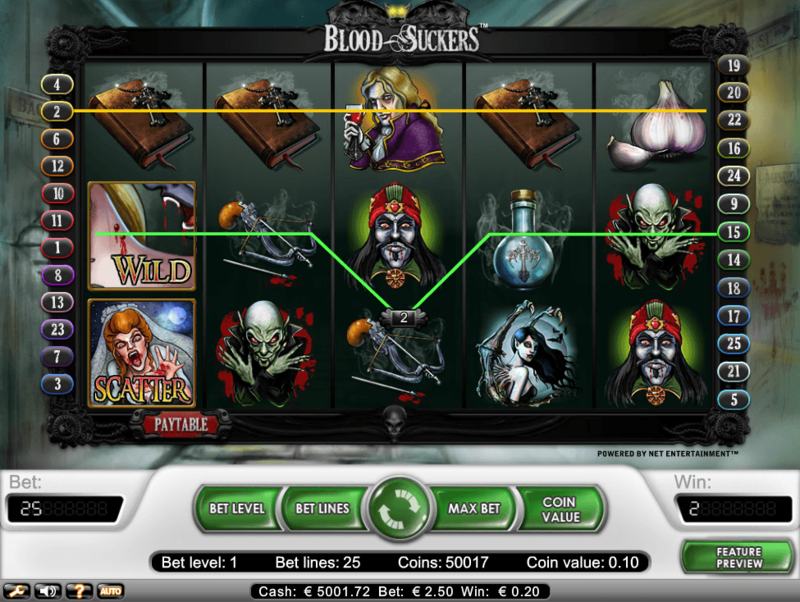 Bloodsuckers have a slight Sweeney Todd theme to it and include a sinister and ominous 25 payline, 5 reel gameboard that is something of a NetEnt staple. The game board is filled with dystopian drawings that would look more in place hanging on the walls of Count Dracula’s Transylvanian abode. Here's a guide of best slot games for different types of players for you to read more. The illustrations are very detailed and exist somewhere between early Scooby Doo artwork and high-end watercolour paintings. The game board does lack playing card symbols but this can be argued to be a positive considering this move is usually a way to fill the game board when all ideas have run dry. The symbols on the reels include; a blue potion, a clove of garlic, a vintage Smith western pistol, a silver cross and a bloodied arrow. In addition to this, the gameboard and bloodsuckers itself are pieced together by the spooky characters that hover on the reels. Meet the jewelled turban voodoo man, the alien headed goblin vampire, the girl with bat wings, and Sweeny Todd himself. All NetEnt games feature some wonderful soundtracks and this one is no different. It’s no Guns and Roses but the whooping and whistling of the wind certainly create an atmosphere to unsettle. Upon any winning combination, an organ chord springs into life creating the ominous church like sounds that you’d associate with a Bloodsucker himself. 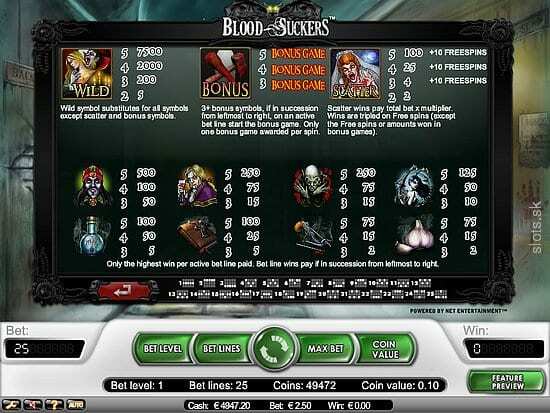 Locate 3 Scatter symbols to enter the Vampire Slaying bonus free spin game. The WILD symbol on this game is the vampire chowing down on some poor lasses neck and as per usual can be substituted for any other symbols on the game other than the BONUS and SCATTER symbols. The BONUS symbol is the CLOKE and DAGGER symbol and matching three of these across any particular win line will see you enter an underground burial chamber to take part in a bonus game. BONUS games are often a pick and click round, where you are given a series of options to choose a prize from, they all follow this same pattern along with the game’s theme placed on top of it in true NetEnt fashion.